We are all tremendously excited by this experiment - who knows where it will lead? The molecules are tiny parts of the two substances known as terpenes - a set of chemicals which are often aromatic and flavour-active. It is believed the experiment is the first time anyone has ever studied terpenes and other molecules in near-zero gravity. The researchers are also measuring the molecules' interaction at normal gravity on Earth so they can compare the way the particles mature. 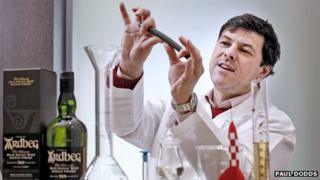 Michael Johnson, chief technical officer of NanoRacks LLC, said: "By doing this microgravity experiment on the interaction of terpenes and other molecules with the wood samples provided by Ardbeg, we will learn much about flavours, even extending to applications like food and perfume. "At the same time it should help Ardbeg find new chemical building blocks in their own flavour spectrum." Dr Bill Lumsden, head of distilling and whisky creation at Ardbeg, which has been producing whisky for more than 300 years, said: "This experiment will throw new light on the effect of gravity on the maturation process. "We are all tremendously excited by this experiment - who knows where it will lead?"